Senate of the Philippines begins its hearing on several measures calling for stricter regulation of land-based #transportation today. Also invited were representatives from the National Center for Commuter Safety and Protection, University of the Philippines-National Center for Transportation Studies, Bestlink College Novaliches, Panda Coach Tours and Transport, and Haranah Tours, among others. 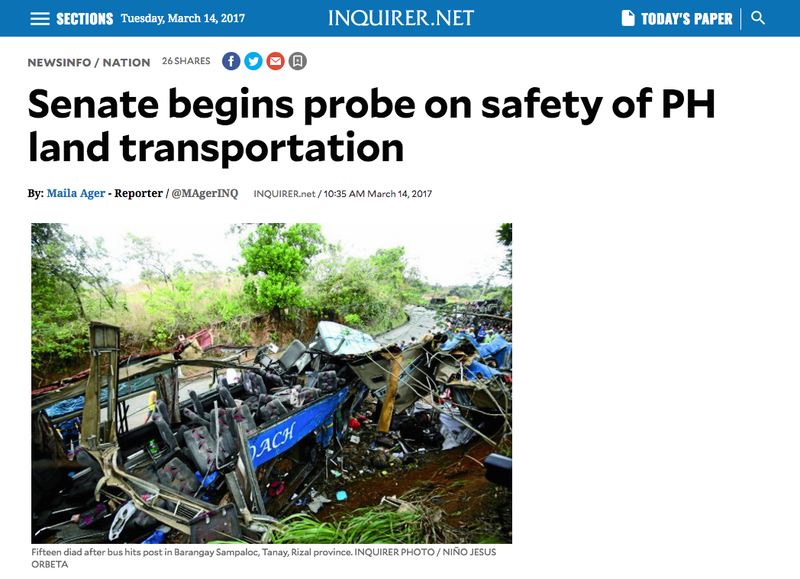 A Panda Coach bus carrying students of Bestlink College was traveling along Sitio Bayucal in Barangay (village) Sampaloc in Tanay in the morning of February 20 when it allegedly lost its brake and slammed onto a post, killing 15 people.